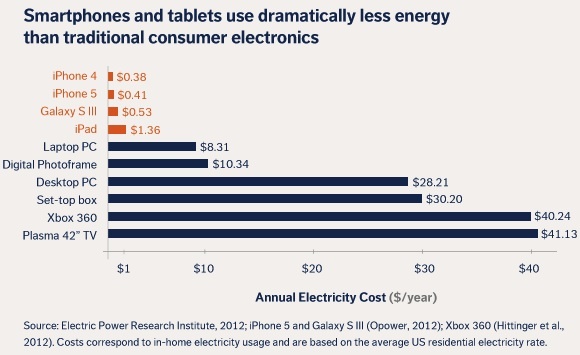 Today energy efficiency company Opower published a study estimating the annual cost for charging the new iPhone 5 at $0.41. While a user’s actual cost varies based on electricity rates in their regions and on use, the company's estimate assumes that a user charges the device once per day at 11.8 cents per kWh (U.S. average). “Even if we consider just the 170 million iPhone 5’s that are projected to be sold globally in the next year, their aggregate electricity requirements are nothing to sneeze at. The collective annual electricity consumption of the iPhone 5’s sold within 12 months will be equivalent to the annual electricity usage of 54,000 US households (roughly equivalent to the size of Cedar Rapids – the second largest city in Iowa). That’s just for one smartphone model over one year”. The study also notes that smartphones consume significantly less energy than other kinds of entertainment devices, and transition from more traditional entertainment devices to smartphones can be of significant benefit to energy consumption. The surge in smartphone usage is only one part of a massive increase in consumer electronics, which now account for about 13% of household energy usage in United States. That growth has been spurred by a considerable increase in the numbers and kinds of electronic devices being used in homes, from gaming systems to televisions to computers. А я могу надевать более тонкие носки и трусы и буду экономить по 10 калорий в день из-за более меньшего веса, что мне придется переносить при ходьбе. Малое энергопотребление это конечно хорошо, вот бы он еще работал автономно более трех дней, а не полдня. Хотя наверное от того и такое маленькое энергопотребление, если он полдня не работает, то и не потребляет. Сплошная экономия!